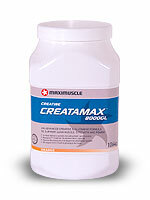 Pete says: Creatamax Extreme is the new improved Creatine/Glutamine product previously known as Maximuscle Creatamax 8000GL. At time of writing Maximuscle haven't added this product to their web-site, so we have the old Creatamax 8000GL image and the Creatamax 8000 details, but from what we can make out, the main difference is the addition of new fenugreek extract 4-hydroxyisoleucine and a few other bits, all of which Maximuscle claim enable an even greater uptake of nutrients through Insulin mimicking without the need to increase the amount of simple sugar. Creatamax Extreme is a new generation creatine complex, containing a blend of pharmaceutical grade creatine monohydrate, powerful performance nutrients and the exciting new fenugreek extract 4-hydroxyisoleucine. Creatine is used in muscle tissue for the production of phosphocreatine, an important factor in the formation of ATP, the source of energy for muscle contraction and many other functions in the body. Creatine supplements have become increasingly popular with people wanting rapid gains in muscle size and strength. Through it's ability to mimic the actions of insulin, Creatamax Extreme is able to boost cellular nutrients uptake, while simultaneously reducing the quantity of dextrose previously required to spike insulin (to drive nutrients into muscle cells). Naturally found in the body and common foods, Creatine is intrinsic to the production of instant high intensity energy (such as sprinting and lifting weights). However, creatine stores are rapidly depleted within 10 seconds (a big factor in maximal effort fatigue). Creatine supplementation safely increases intra muscular levels of creatine and boosts performance. Glutamine is a nutrient essential for muscle growth, as it's the most abundant amino acid in muscle tissue. Supplementation with Glycocyamine can ensure a more powerful effect from the use of creatine. Glycocyamine also appears to be very effective for those who see no benefits from creatine. In other words, it turns creatine "non-responders" into "responders." Scientists think this nutrient might also boost your own creatine production. Writing in the January 2003 issue of Flex magazine, Jim Wright thinks that glycocyamine might be "the most significant advance in creatine supplements since creatine monohydrate was originally introduced to the bodybuilding market." Most creatine supplements use large amounts of carbohydrate to force creatine and other nutrients into your muscles. The problem is that excess carbohydrate calories have the potential to cause fat gain. The amino acid Glycine - in very small amounts - helps to force more carbohydrate and creatine into your muscles, without filling you with excess calories . This means you'll gain muscle without getting fat. Bicarbonates are referred to as "alkaline" salts. This means they have the ability to neutralise or counteract acids. Both potassium and sodium bicarbonate can reduce acid levels in the stomach, increasing the uptake and absorption of various nutrients such as Glutamine and Creatine. Some experts believe that creatine combined with magnesium is a highly effective way to enhance and extend the effects of creatine on muscle size and strength. When minerals such as magnesium become surrounded by and bonded to amino acids, in a stable form, this is referred to as chelation. Chelation is a natural means for the body to transport minerals across the intestinal wall as part of digestion. Experts believe that the creatine-magnesium chelate in Creatamax Extreme helps to enhance absorption of creatine and decrease stomach discomfort. Some initial research shows it is better absorbed and tolerated than traditional creatine monohydrate. It also mixes well in water. D-pinitol is a form of pinitol, a naturally-occurring compound found in certain plants, trees and foods, such as soy. Studies show that it has insulin-like effects, driving creatine and other nutrients into muscle cells. The effects of Pinitol have been described by noted experts such as Dr. Daniel Gwartney, M.D. Gwartney points out that "... of all the proposed so-called insulin mimickers and insulin co-factors, pinitol is the one with the most promise." The effectiveness of Pinitol has been known by top US experts for some time, and it has been awarded two U.S. Patents (#5,550,166 and #5,827,896). D-pinitol is very popular with people who want to use creatine, but don't want the extra calories and sugar contained in many creatine-based supplements. In a trial completed at Arkansas State University , researchers examined whether co-ingestion of D-pinitol with creatine affects whole body creatine retention.The results show that D-Pinitol increases whole body creatine retention to the same extent as high levels of carbohydrate or carbohydrate and protein . Bioperine� is a standardized piperine extract obtained from the fruits of the black pepper and/or long pepper plants. It has little effect on weight loss, lean muscle gain or sporting performance. Rather, the main effect of Bioperine� is to enhance the bioavailability of various nutrients consumed with it. The amino acid 4-hydroxyisoleucine contained in Creatamax Extreme takes creatine supplementation to new levels, due to it's insulinotropic properties. A recent study by Dr. Ruby and colleagues at the University of Montana analysed the effects of 4-hydroxyisoleucine compared to a glucose beverage on rates of post-exercise muscle glycogen re-synthesis in trained male cyclists . The study found that the combination of 4-hydroxyleucine and carbohydrate consumption, promoted a 63 percent greater rate of post-exercise glycogen re-synthesis compared to carbs alone. However, 4-hydroxyleucine was shown to enhance glycogen re-synthesis without raising insulin levels (compared to carbs alone). This means that the benefits which in the past have relied on carbohydrate mediated insulin production (including creatine uptake and glycogen storage) may now be attained with fewer carbs and lower insulin levels. Essentially, 4-hydroxyisoleucine may promote greater creatine uptake, greater muscle glycogen re-fuelling, and preferentially store nutrients in muscle cells rather than as fat.